Neurophotonics and Biomedical Spectroscopy addresses the novel state-of-the-art work in non-invasive optical spectroscopic methods that detect the onset and progression of diseases and other conditions, including pre-malignancy, cancer, Alzheimer’s disease, tissue and cell response to therapeutic intervention, unintended injury and laser energy deposition. 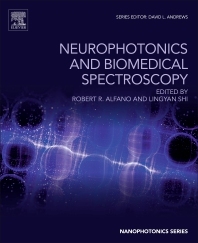 The book then highlights research in neurophotonics that investigates single and multi-photon excitation optical signatures of normal/diseased nerve tissues and in the brain, providing a better understanding of the underlying biochemical and structural changes of tissues and cells that are responsible for the observed spectroscopic signatures. Topics cover a wide array of well-established UV, visible, NIR and IR optical and spectroscopic techniques and novel approaches to diagnose tissue changes, including: label free in vivo and ex vivo fluorescence spectroscopy, Stoke shift spectroscopy, spectral imaging, Resonance Raman spectroscopy, multiphoton two Photon excitation, and more. Lingyan Shi is a research scientist at Columbia University, USA. Her current research focuses on metabolic imaging with stimulated Raman scattering microscopy. She was a research associate studying deep imaging and drug delivery in the brain at the Institute for Ultrafast Spectroscopy and Lasers, the City College of New York, USA, where she received her PhD in biomedical engineering.